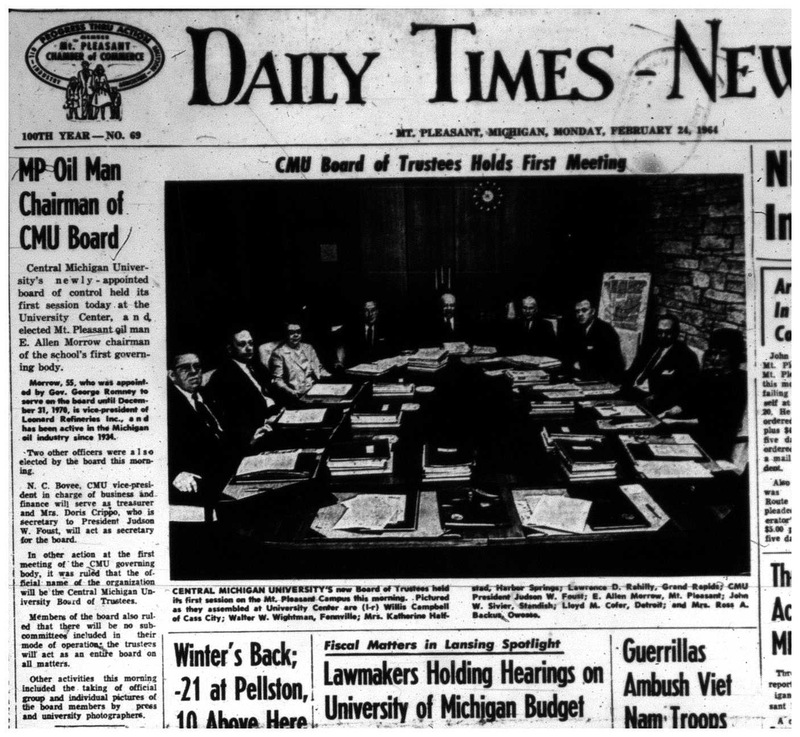 For much of the first 72 years of Central Michigan University's existence, the major institutional decisions were made by the Michigan State Board of Education. But that all changed in 1963 when voters ratified a new State Constitution. Article VIII, Section 6 of the 1963 Constitution gives bachelor's degree-granting institutions their own independent boards of control. These boards of control were designated to be made up of eight members, appointed by the governor for eight year terms, with no more than two terms expiring in the same years. Per the Constitution, the new Board of Trustees - the title CMU would adopt for the governing board - was to "have general supervision of the institution and the control and direction of all expenditures from the institution's funds" beginning on January 1, 1964. Due to Governor Romney's busy schedule in the early part of 1964 and the need for numerous gubernatorial appointments at all of the state universities, the Board was not fully formed until February of 1964. As soon as the trustees were appointed, on February 13, plans for the first meeting got under way. The eight members of the board were Jean Backus, Willis Campbell, Lloyd Cofer, Katharine Hafsted, Lawrence Rahilly, E. Allan Morrow, John Sivier, and Walter Wightman. The first trustees meeting was scheduled for February 24, 1964 at 10:00 am. The Trustees, along with President Judson Foust, Dr. Norval Bovee (Vice President of Business and Finance), and Doris Crippo (Administrative Assistant to President Foust) met in the President's Conference Room of the University Center. Dinner, after the day-long meeting, was scheduled for 5:30 pm. The report from the first meeting noted that the Trustees discussed their newly adopted formal name - "Central Michigan University Board of Trustees" (p. 1). They also discussed tuition, what defined state residence for tuition and fees, capital improvements and expenditures, and faculty and staff personnel matters, such as pay increases, leaves of absence, resignations, and appointments. 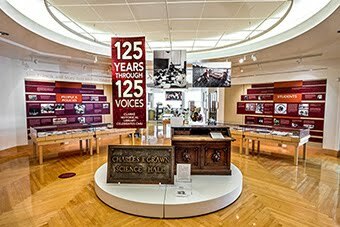 In addition, the Board identified the honorary degrees to be granted to commencement speakers in June and formally accepted gifts to the University, including a $10 gift from a student for the Creative Arts Room and $119,600 in National Science Foundation grants (p. 5). In the 50 years since that first meeting, quite a bit about CMU has changed - the University's built environment now extends well south of Preston, Central athletics program have attained NCAA Division I status, there are now eight colleges and over 200 academic programs, and the number of students enrolled has increased nearly five times. But there is still an independent board of eight trustees, appointed by the governor, who oversee the major operations of the University. The Clarke looks forward to documenting the next 50 years of the Central Michigan University Board of Trustees and beyond. 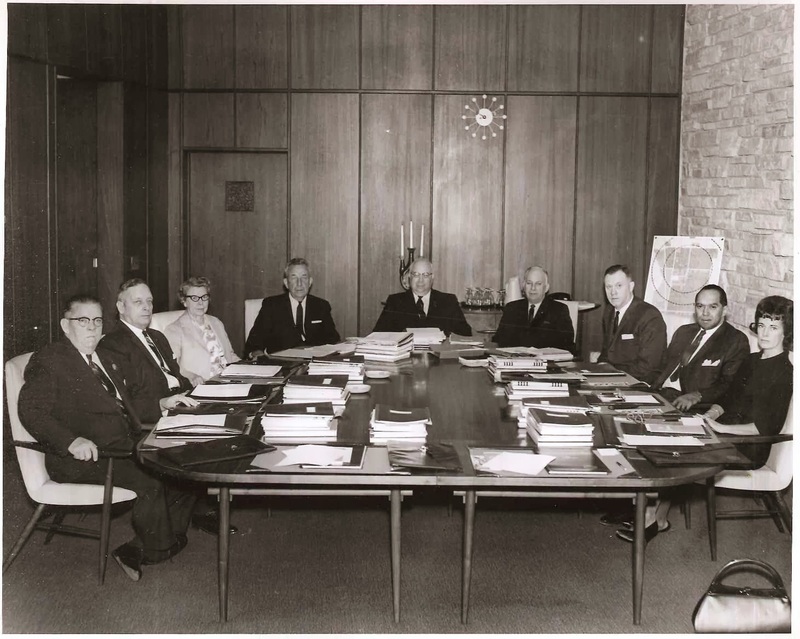 Pictured at the first Trustees meeting on February 24, 1964 are, from left to right, Willis Campbell, Walter Wightman, Katharine Hafsted, Lawrence Rahilly, Judson Foust (CMU President), E. Allan Morrow, John Sivier, Lloyd Cofer, and Jean Backus.